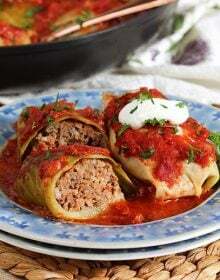 All the flavors of Stuffed Cabbage Rolls without all the rolling! 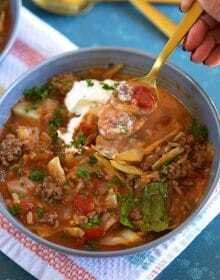 The very Best Stuffed Cabbage Soup is like the lazy girl’s stuffed cabbage recipe….all the ingredients thrown into a pot and simmered to perfection. 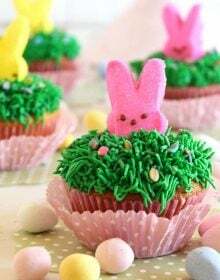 Freezer friendly, too! We’re one day closer to winter and the wind last night made me very aware that it’s time to put away the shorts even though I haven’t worn them in weeks. The bus stop is, once again, dreadful in the morning with the wind whipping up the hill and hitting us all square in the face like a left hook instead of a kind “good morning” greeting. AND we’re going through our first round of colds here….it’s going to be a long winter. 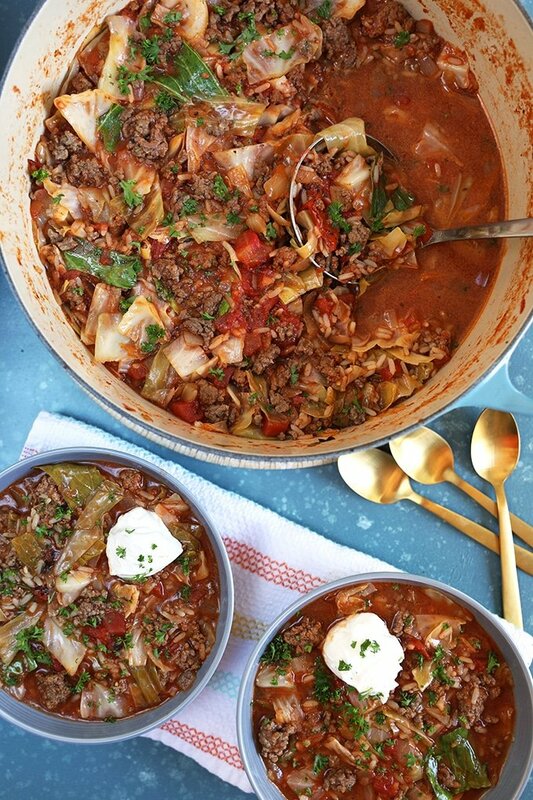 So, I’ve been stocking the freezer with my favorite soup recipes and sharing them all here because I don’t know what the heck I was doing the past several years but GUYS….I have soooo many recipes still to share with you and this Stuffed Cabbage Roll Soup is one of them. 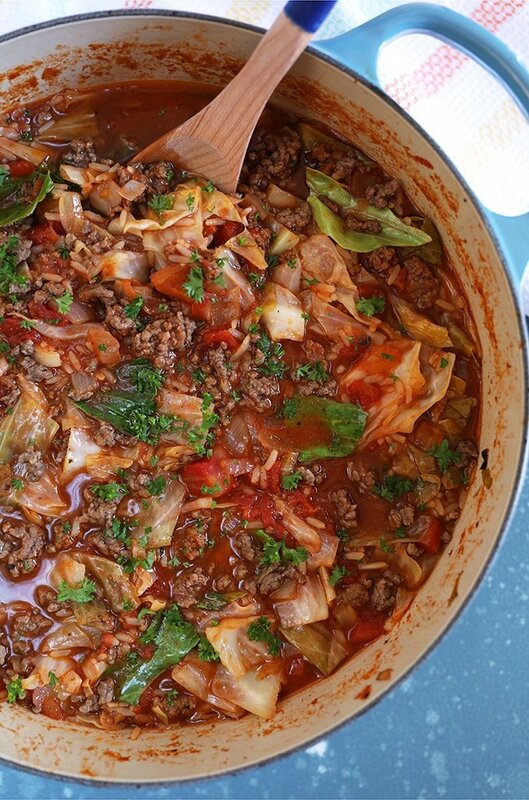 Just like my grandfather’s Stuffed Cabbage Rolls, this Stuffed Cabbage Soup is tangy, sweet, savory and hearty. All the things you want in a winter comfort food but without all the prepping, rolling and wrapping that’s required when making traditional stuffed cabbage. This easy Cabbage Soup recipe is a “toss everything into the pot and go” kinda meal. What is Stuffed Cabbage Roll Soup? 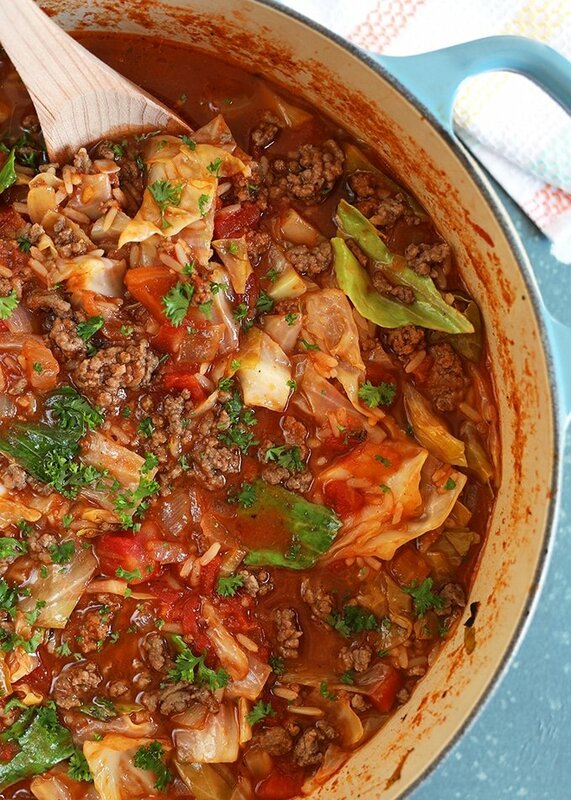 Also known as Unstuffed Cabbage Roll Soup, this Stuffed Cabbage Soup recipe is a blend of everything you’d find in a stuffed cabbage roll but unassembled and stewed in a pot for a bit until the cabbage is tender. 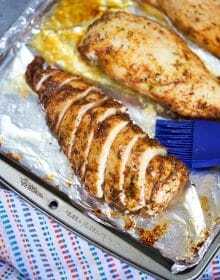 The longer the soup simmers the more flavorful it will be but you can have this on the table in less than 45 minutes from start to finish. What are the ingredients in Stuffed Cabbage Soup? 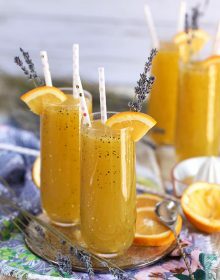 The secret is really in the sauce….for a bit of tartness I like to add apple cider vinegar and for sweetness I stir in grated apple. 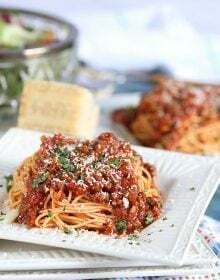 It’s a such a great way to boost the flavor profile in the sauce without it being overly sugary. 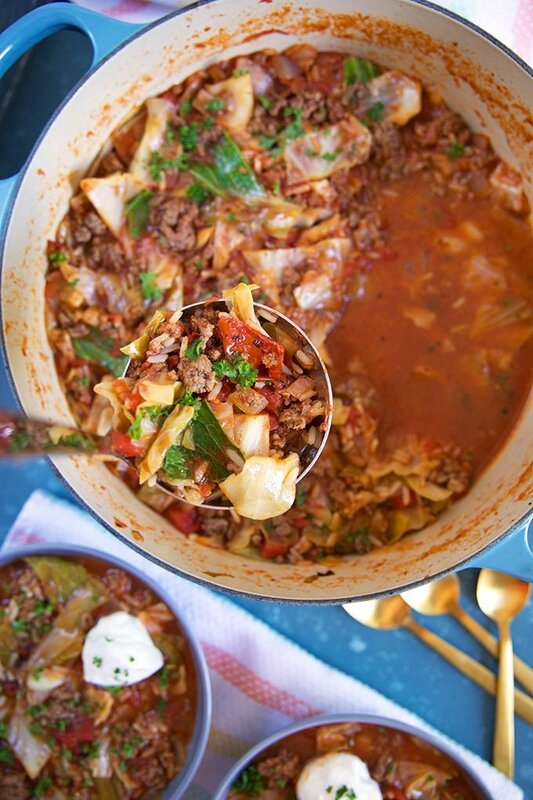 How do you make Stuffed Cabbage Soup? In a large pot, brown the ground beef until no longer pink. Transfer the beef to a bowl and drain all but 2 tablespoons fat. Add the onion to the pot and cook until softened. Add the butter to the onions and then stir in the cabbage. Cook the cabbage for 10-15 minutes, stirring occasionally, until cooked down. Stir in the rice, tomatoes, tomato sauce, brown sugar, vinegar, apple, Worcestershire sauce and stock. Cook for 20 minutes over low heat until the rice is tender. Add additional stock if needed because the rice will absorb a lot of the liquid. Season with salt and pepper….serve. This recipe for Stuffed Cabbage Soup makes a lot so I like to serve half for dinner to feel the family and freeze the rest in individual containers for quick lunches on the fly. 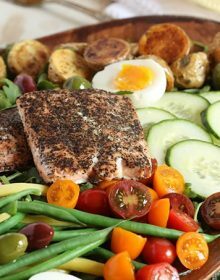 You could also freezer it in a larger container for an easy weeknight dinner months down the road. 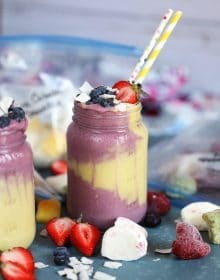 This is already in my freezer for winter! 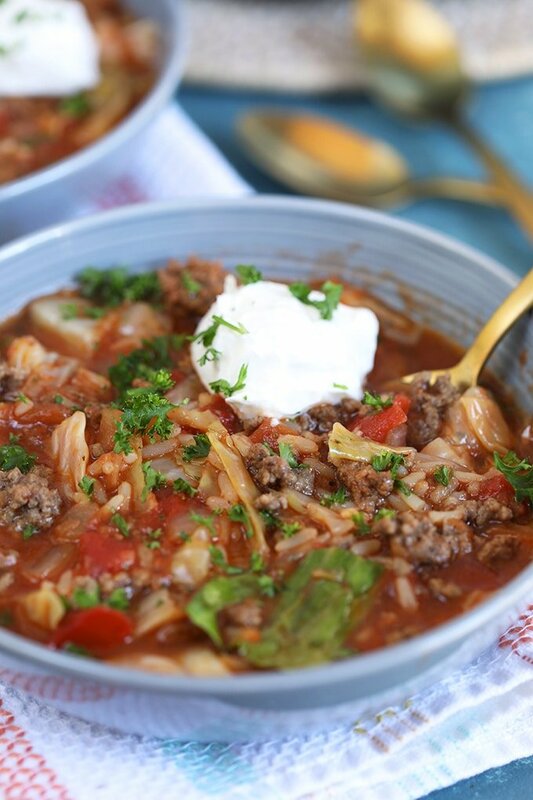 And you could easily make this Stuffed Cabbage Soup in the Crock Pot or Slow Cooker, too. Simply brown the beef ahead of time. Saute the onions and cabbage, then toss everything into the crock pot. Cook on low for 6 hours or high for 4 hours. Easy peasy! 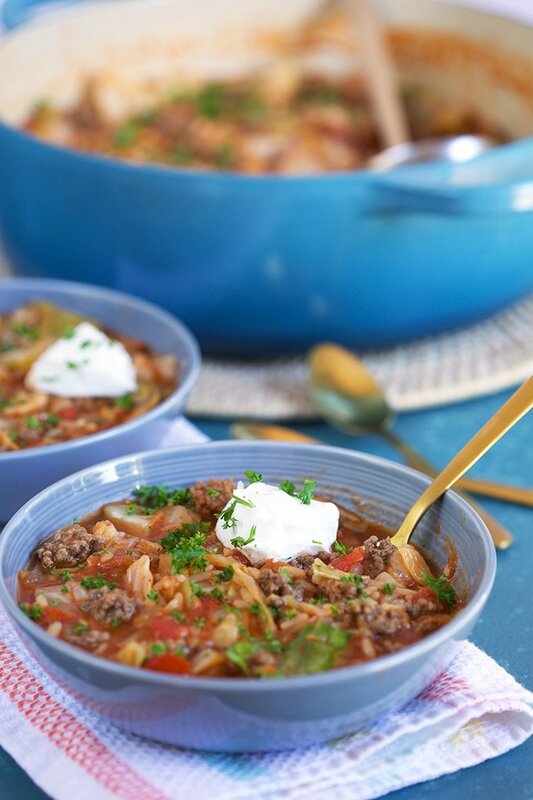 Ready in 20 minutes….Italian Sausage Soup. Sooo good! 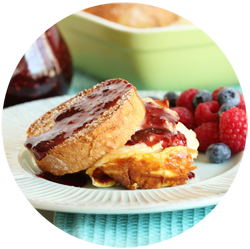 Looking for MORE easy dinner recipes…..follow us on Instagram! 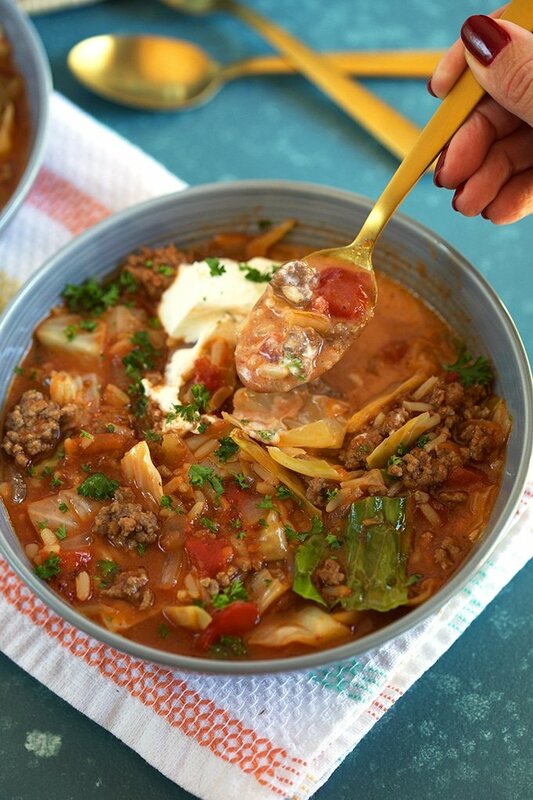 Quick and easy, freezer friendly, the BEST Stuffed Cabbage Soup tastes just like your favorite stuffed cabbage rolls but without all the work. 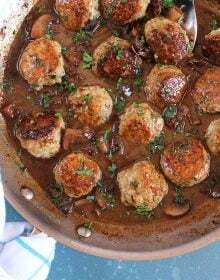 Heat the olive oil in a large stock pot or dutch oven over medium high heat. Add the ground beef to the pot. Cook the beef until browned, breaking up into smaller pieces with a wooden spoon, and no longer pink, approximately 5-7 minutes. Using a slotted spoon, transfer the beef to a bowl. Pour off all but 2 tablespoons fat and return the pot to the heat. Add the onion to the pot and cook for 2-3 minutes or until softened. Stir in the garlic cooking for 1 minute longer. Stir in the butter and add the cabbage to the pot tossing to combine. Cook the cabbage until softened, approximately 10-12 minutes, stirring occasionally. Stir in the tomatoes, vinegar, brown sugar, apple, rice, Worcestershire sauce and beef stock. Bring the soup to a boil then turn the heat to low. Simmer for 20 minutes until the rice is tender. Season with salt and pepper, to taste. 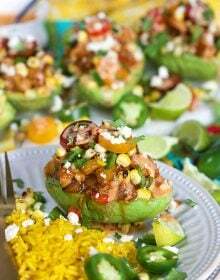 Serve immediately with sour cream, if desired. Stuffed Pepper Soup can be made in the slow cooker or crock pot. See notes above for cooking instructions. Soup can also be made up to 5 days in advance. Store in an airtight container in the refrigerator. You can also freeze Stuffed Pepper Soup in an airtight container for up to 3 months.